My son will be 9 in August. I hope that he’s learned to be compassionate towards others. And I hope that he learns to take action when there’s something that he feels isn’t right. I hope that by seeing me take action and fight for the issues I’m passionate about, he will know and understand that it only takes one person to step up and do something. Every week in The Sunday Paper, we honor an individual who is using their voice, their heart and their mind to Move Humanity Forward. This week, we honor Jeff Lew — a Seattle father who is on a mission to wipe out student lunch debt —as our Architect of Change of the Week. It all started when Jeff read a news article about “school lunch shaming,” a phrase coined to describe how some schools are denying food or singling out students who don’t have enough money on their accounts. Feeling strongly that no child should be denied lunch because of their family’s financial situation, he decided to take action. Jeff launched a GoFundMe campaign to help pay off the lunch debt at his son’s elementary school. He accomplished that, and as word about his kind-hearted effort got out, Jeff’s campaign blew up from there. Now, he has raised enough money to pay off debt at three of Seattle’s largest public school districts, and his impact continues to grow as people across the world chip in and donate. We caught up with Jeff to learn what inspired him to take action and what we can all learn about the power that one person can have in making a difference. As a father, why was addressing this issue so important to you? Just imagining my own child being shamed for not having enough money to pay for his lunch, or not getting a full meal because he can’t afford it, it made me feel this sadness and this ache inside me. And I realized that for some kids, this is their reality: they have lunch debt that they get shamed for or they aren’t given the full meal because of debt. I think, as a father, I don’t want any child to have to go through that or feel that. What do you think your son has learned from your commitment to this cause? My son will be 9 in August. I hope that he’s learned to be compassionate towards others. And I hope that he learns to take action when there’s something that he feels isn’t right. I hope that by seeing me take action and fight for the issues I’m passionate about, he will know and understand that it only takes one person to step up and do something. And it can create a domino effect. Once you stand up and call attention to an issue, the community will rally behind you and good things will start happening. But you just have to take action. Are you hoping to create a movement with what you’ve started? What would you say to parents in other school districts who may see this issue as ‘not my problem’? I sure hope so. I hope that by raising awareness, more people will finally jump in do something about it. Let’s see if we can find a permanent solution to the student lunch debt. And to the parents who think this issue as “not their problem,” I say they’re part of the problem. Imagine your children not being fed because of an oversight on your part, (ie. you forget to make lunch, or you forget to reload their lunch cards, or you just don’t have the funds for your child’s lunch). Wouldn’t you want your child to get fed instead of shamed or denied a full lunch because they don’t have money? What has the response been like? Have people across the country gotten involved as more word has gotten out? It’s been overwhelming. The community has really gotten together and helped out quite a bit. 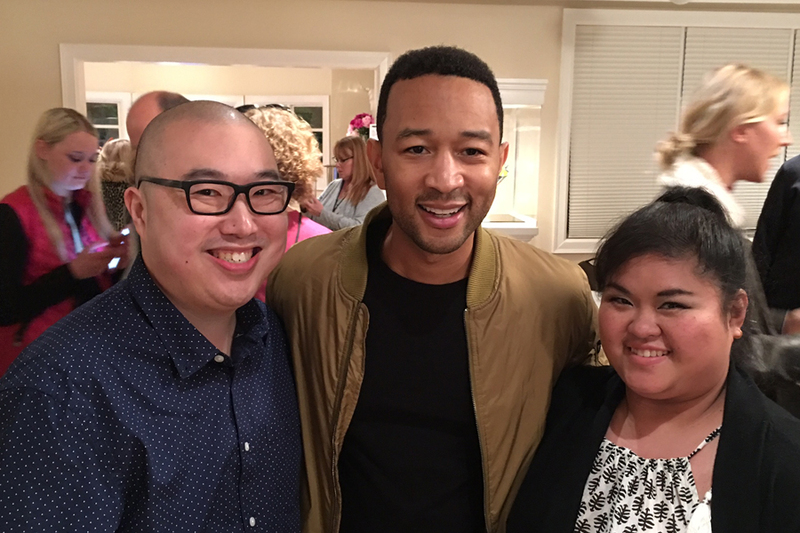 John Legend did donate and I’m so thankful for that. And since the media caught it, other people have as well. And more people are hearing about it and that’s raised more awareness. I’ve heard from the UK, and a lot of others from all over the country, like Chicago. I wish I could help the whole country, but I’m only one man. What I can do is help out others who might want to do a campaign for their own school district. I love that a lot of people are wanting to get involved and do something for their own community. On this Father’s Day, what does fatherhood mean to you? To me, it means being a role model for my children, being a person that they can always count on, always being there through thick and thin, being a person that will always support them and encourage them no matter what they choose to pursue in life, and to celebrate all their accomplishments. What role do you see for yourself as a “role model” and how important is it to you to teach your son to make a difference and move humanity forward? I want my kids to see me as a supportive father: always willing to listen to anything and everything, and that it’s always safe to discuss any topic they want. I think it’s important to me to teach all my kids that if they want to make a difference in the world, they can. It’s important for me to lead by example and show my kids that out of millions of people, one person can stand out and make a difference. “I’ve learned that people will forget what you said, people will forget what you did, but people will never forget how you made them feel.” Maya Angelou said that. And I strive to do things that will incite others to feel something, to move them, to feel my passion, and in turn spread kindness to others. I think that’s an important message to pass along to my children. Sign-up for Maria Shriver’s Sunday Paper newsletter to receive new articles like this in your inbox each week.